To a kitten or puppy! If you search on the internet for “Kittens (or puppies) for Christmas” you are bound to find a lot of opinionated articles about why pets make terrible holiday or birthday presents. While I agree with that statement on the surface, I don’t typically like making blanket statements that would make otherwise responsible pet owners feel like they are doing something wrong. If you are thinking about purchasing/adopting a kitten or puppy for a family member as a gift based on the reaction they will have to seeing the cute little bundle of fluff with a bow on its head you probably have the wrong idea. I will concede that kittens and puppies are cute but they also live a relatively long time. It would not be surprising for a kitten or puppy purchased as a gift for a six year old child to still be alive when they graduate from college. That is sixteen years, eight hundred and thirty two weeks or almost six thousand days of feeding, walking, scooping the litter box or cleaning the yard. If you’re looking for an impulse buy get them an ipad, it’s cheaper in the long run and won’t last nearly as long. Also, electronics don’t do any worse if they are not cared for after a child becomes bored with them. There are people out there who already know all of the information in the above paragraph and might still want to get a loved one a kitten or puppy for Christmas. If you were going to get a puppy or kitten anyway and think that it would make a fun gift or would enhance the morning gift opening session there are a few things to think about first. If you are planning to have a lot of people at your house this Christmas, you might think about taking a slightly different approach to bringing a pet into your home. Instead of getting the puppy or kitten on the big day have your gift recipient open the food dishes, leashes, litter box and other pet accessories with a photo of the soon to be adopted pet. That way the young animal isn’t stressed by the activity of the house during the holidays but the recipient still gets the joy and anticipation of the new pet. If it is going to be just your family at home this holiday season then the time between Christmas and New Year’s might actually be one of the best times all year to welcome a new pet. Typically, people are home more during this period and can spend the time it takes to get the new pet adjusted. Children have off from school during this period and may have more time to get used to the responsibility that accompanies a new pet. Be sure to pick up all of the accessories necessary for a new pet. If you are a motivated pet owner and want to get an idea about the total costs and responsibilities that you will face in the first year book an appointment with a veterinarian just for a consult. This time of year our schedules are typically clear enough for us to view this type of an appointment as an enjoyable and productive use of our down time and I would be surprised if a veterinarian charged very much if anything at all for such a visit. I know we would be happy to give a potential or current client 15 – 20 minutes to ask a few questions and get an idea of what they could expect. We would even be willing to print you out an idea of what type of visits and what type of expense you would be looking at for the first year. 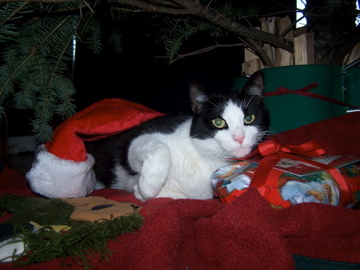 There is a responsible way to get a pet as a gift during the holiday season. If you are thinking of adding a furry family member to your home this year adding them during the holiday season can be just as responsible and perhaps a bit more memorable than other times of the year. Remember you can always follow me on facebook or twitter. I often will post other blogger’s articles and small notes throughout the week. So you get a little more than just the blog. Hope your holidays are safe and fun.